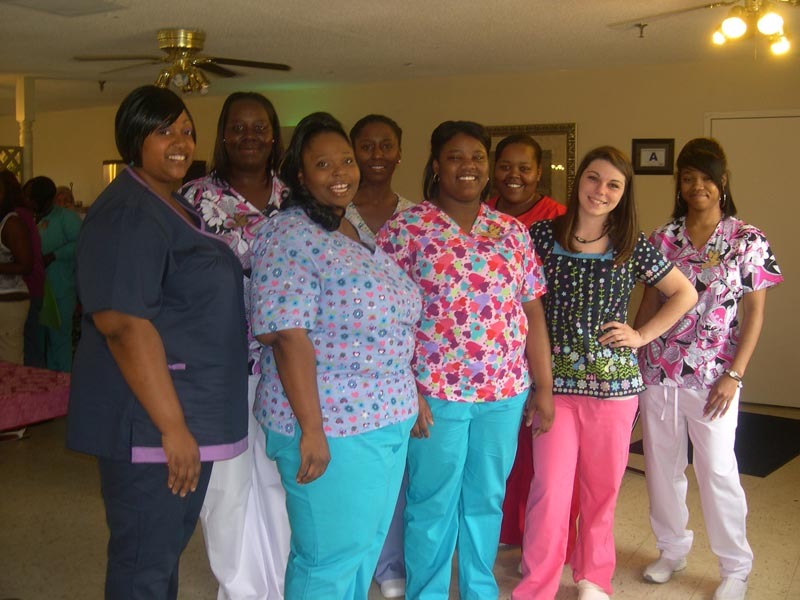 CNA graduates are: first row, left to right, Solanda Tabb, Brittany Rollins, Amber Coursey; back row left to right, Samantha Young, Erika Stevens, Tekisha Gilchrist, Tiffany Miles and last, at the end of the row Shamoria Gordon. Another graduation of CNAs (Certified Nursing Assistants) at Trinity Mission Health and Rehab called for a ceremony held in the dining room of the place where they trained. Heading up their training was Barbara Seay. Nursing month is celebrated this month (May) as they begin their professional lives. When Ms. Seay delivered the certificates to the eight successful graduates of the CNA program, she then read a poem of inspiration to them and to the audience which held family members of those graduating. The poem, A Place For Me, read: One thing in common most of us share/We’ve lived long lives and now we need care/Some need a little, while others need a lot/and the staff works hard to give all they’ve got. The young people graduating will be caring for many in their future. Ed. Note: “May 6-12, 2012 will be National Nurses Week in South Carolina, said Vicki Green, president of the South Carolina Nurses Association, recently. “This week celebrates all of the outstanding professional contributions to the delivery of healthcare in South Carolina. The theme for the 2012 Nurses Week highlights three of the most important roles of all nurses as they provide quality healthcare to people across our state, commented, Ms. Green.